Advanced arthritis of the glenohumeral joint can be treated with shoulder replacement surgery, in which the damaged parts (humeral head and glenoid) of the shoulder are partially removed and replaced with artificial components, called "prostheses". -Hemiarthroplasty: Just the head of the humerus is replaced by an artificial component. -Total shoulder arthroplasty: Both the head of the humerus and the glenoid are replaced. A polyethylene “cup” or a metal back component with a polyethylene liner is placed into the glenoid and a metal “head” is attached to the top of the humerus. A functional deltoid muscle and functional rotator cuff are required for this type of shoulder replacment. 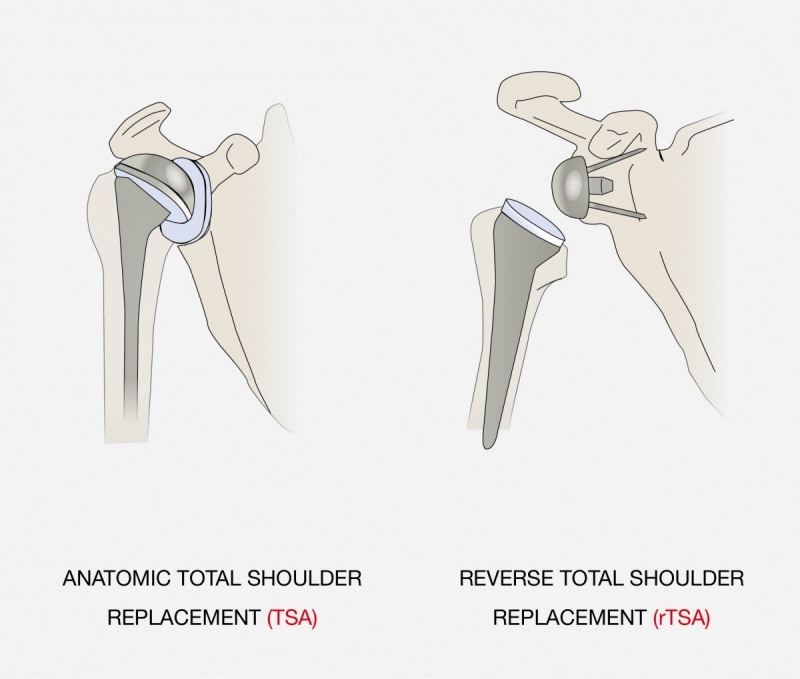 -Reverse total shoulder arthroplasty: In a reverse total shoulder reconstruction, the materials of the socket and ball are “reversed” compared to a conventional total shoulder arthroplasty. The metal "head" is fixed to the glenoid and a polyethylene cup is fixed to the upper end of the humerus. A reverse total shoulder replacement works for people with rotator cuff tears, cuff tear arthropathy and osteoarthritic joints. The more recent designs inverted materials, so polyethylene glenosphere will meet a metal humerus liner. A functional Deltoid muscle is needed for a reverse shoulder replacement. Range of motion and stability also depend on the remaining anterior and posterior parts of the rotator cuff muscles. Depending on bone quality and the diagnosis, all these types of prothesis are possible to implant with or without ("stemless") a humeral stem. -Resurfacing Shoulder Arthroplasty: The damaged surface of the humeral head is replaced with a smooth, perfectly round metal cap. Many replacements now can be achieved with a “resurfacing” which allows more of your own bone to be maintained. All above mentioned shoulder prosthesis can fail for many different reasons, such as trauma, infection, aseptic loosening, rotator cuff failure in Hemi and Total Shoulder Arthroplasty, component dislocation and wear. When this occurs, further surgery, called "revision prosthetic surgery" with the implantation of a new prosthetic implant could be necessary.